On March 28, 2014 the Centers for Disease Control and Prevention (CDC) reported that an estimated one in 68 children is on the autism spectrum. That is a 30% increase from the 2012 estimate of one in 88 children. As a parent of a 20-year old son with autism, increased public awareness and support for people on the autism spectrum are always welcome. But as a researcher in autism, the apparent spike in prevalence threatens to draw attention away from plausible causes and toward speculation about some fearsome “epidemic.” When the national dialogue shifts to sounding alarms and stamping out epidemics, acceptance and support can easily shift to avoidance and fear. Autism is a condition that’s defined and diagnosed by its symptoms. Unlike many conditions, there is no blood test, brain scan, or other biological marker that confirms autism, nor is there some exact measure that separates neurotypical people from those on the spectrum. Instead, many features of autism are characteristics that ordinary people share, but are expressed to the point that they significantly interfere with communication, behavior, and social interaction. One way to think about autism is that we’re all part of a continuum. We don’t all have autism, of course, but people with autism are not separate from us--they experience the things that we do, but often with a far different intensity. We all know what it feels like to have our senses overwhelmed, or to be anxious in a social situation. Our nervous system can usually regulate or “inhibit” the outside world from overwhelming us, but a person with autism might live just below that threshold all the time, and it may not take much to push them beyond it. Likewise, we all have our own rituals and passions. It’s human nature. For example, some of us have a hard time eating something on our plate if it touches another food it’s “not supposed” to touch. Others may have a very particular daily routine that they don’t like to have disrupted. The question is how much these things interfere with our day-to-day lives. The variation in many human traits like height, verbal ability, and math skills can be described using a bell-shaped curve. The highest point of the bell is the average across all individuals, and roughly two-thirds of all people are within a certain distance – called a “standard deviation” – from the average. Similarly, autism-related traits like communication difficulties, social anxiety, and unusual habits or rituals seem to be distributed across the general population, with clinical autism being an extreme of these traits. So what does it mean that one in 88 children were on the autism spectrum in 2012? 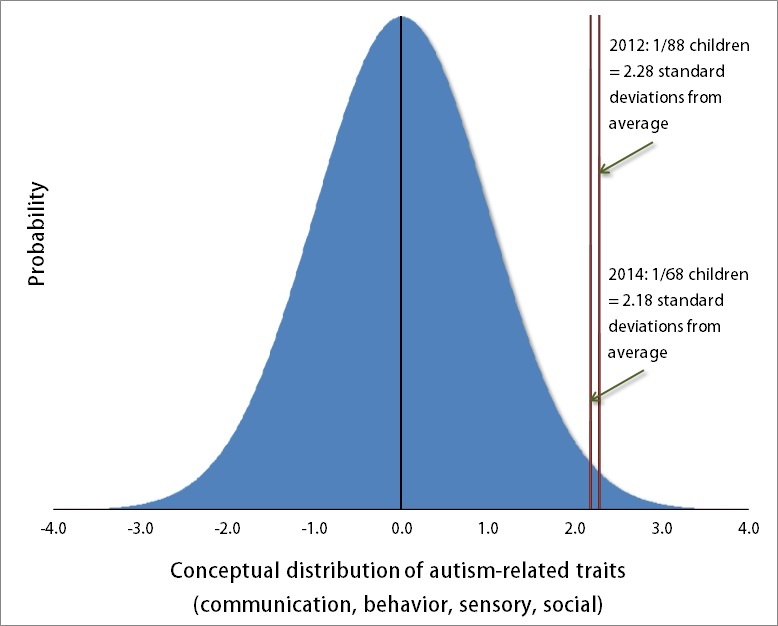 On a bell-curve, it implies that children on the spectrum showed autism-related symptoms that were at least 2.28 standard deviations from the average child. Two years later, the new 2014 CDC estimate of 1 in 68 implies that children on the spectrum showed autism-related symptoms that were at least 2.18 standard deviations from the average child. That implicit change from 2.28 to 2.18 standard deviations accounts for the entire 30% increase in the prevalence of autism. Given this small change in the statistical boundary, the increased prevalence of autism since 2012 seems likely to be explained by increased efforts to identify children on the spectrum and a shift to slightly broader diagnostic criteria. Not surprisingly, as the number of individuals diagnosed on the autism spectrum has increased, the proportion of individuals with severe forms of autism has also declined. These "classical" or "Kanner-type" individuals often have little or no speech, significant movement difficulties, overwhelmed sensory systems, and other severe symptoms. This is an important aspect of autism prevalence. As we attend to the needs of a larger population of individuals with an autism label, we should be very careful not to leave those already without a voice with even less of one. There’s no question that the increased prevalence of autism demands a response. More research is imperative – not to stamp out an epidemic, but to deepen our understanding of autism, and to find interventions that might improve lives. More resources and support are also critical. What the one in 68 of our children on the autism spectrum need is to be seen not just for their differences, but for all they have in common with us. They need us to understand that even if they are unable to speak, they still have something to say. They need us to hear the unspoken words that motivate even the most difficult behavior, and to patiently teach them effective alternatives. They need us to recognize that even if they may be overwhelmed by social interaction, they long for friendship like the rest of us. They need us to create a world where we adapt to their needs as much as we ask them to adapt to ours. They need a future that holds the hope of meaningful work, community engagement, and dignity as adults. In short, they need us to see them not only as part of the spectrum beyond 2.18 standard deviations, but as part of the spectrum that includes every one of us. John P. Hussman is the director of the Hussman Foundation and executive director of the Hussman Institute for Autism, and has authored and co-authored numerous research studies on the genetics and neuroscience of autism.